All this was going on in sunny Jacksonville and the "reliever" was brought in for 5 days of playing "zone" defense, changing dumpy diapers, and entertaining 2 rowdy toddlers. I was not alone during this 5 day period, as we shifted to "man to man" and a "full court press" defense with the help from Gaga Ian, Gaga Linda, Gaga Jody, Uncle Joe, and of course one of Addy and Lilly's favorite friends Jordan Underwood (Uncle Joe's lady friend). My mom and Gaga Linda helped me on Monday and Tuesday as I ventured to work, but Wednesday I was on my own. All in all, I absolutely loved every second I spent with my girls over the course of that 5 day stretch. We made pancakes, french toast, sugar cookies, went to the YMCA, went to BW3's, played with poker chips (a new game I invented, where I hide poker chips all over the house), colored with crayons, paints, and magic markers, made paper snowflakes and put them on the tree, went to Jared and Ashley's open house, built a two-room fort in the basement with a secret entrance and a secret hiding spot that Lilly loved, and of course went to the Children's museum (see pics). I was enlightened during this past Wednesday, as I realized that I am going to take off at least one day a month for "daddy" day. Be it spent at the zoo, children's museum, or just in the basement in the fort, it's going to be a day that I spend solely with my precious daughters. Mom, you're invited for lunch. As usual, I did find myself being reminded as to why Aimee is sometimes a little tired when I walk in the door at 6:00 from work. It's hard work helping these young ladies advance through life.....not to mention how many times a day we still change diapers. 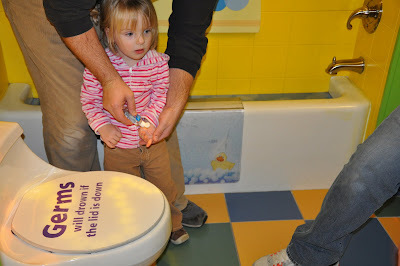 Can potty-training be a new year's resolution? 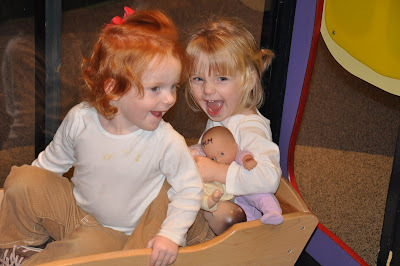 Addy and Lilly laughing in a babies cradle in the Children's Museum "Playscape". Jordan and Addy going down the one-story slide. Think Christmas Story slide. 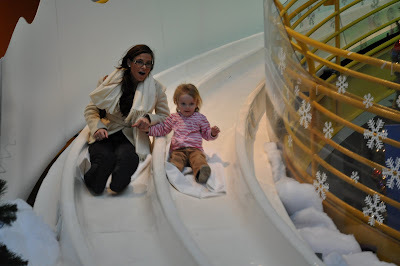 [Ralphie is shoved down the slide, but he stops himself and climbs back up] "No! No! I want an Official Red Ryder Carbine-Action Two-Hundred-Shot Range Model Air Rifle!" "GERMS will drown if the lid is down" - Daddy putting anti bacterial gel on Addy's hands. (I had Jordan take a pic to prove to mommy that we were protecting ourselves from H1N1) . I'm so proud, Jeremy!!!!! You're such a good Daddy. and good luck with the potty training! Great Blog Jeremy, you are a great Dad and I know that the girls loved having you all to themselves. We had a great time with the girls they are just so engaging and busy all the time. Looking forward to seeing you all at the end of the week. Brooke--the outfits were all him! This was the first time I left without an itemized "Guide" laminated on my fridge. Love the post -- looks like you did a dandy job, Jeremy! This smacks of the "Oscars" with a last minute attempt to become father of the year!!!! The girls eyes light up when they see Jeremy arrive home and each and every time they find a poker chip they say"right here!" They even call it Daddy's game.The other saying they kept repeating like a comforting mantra was " mummys always come back" They are too funny for words. Thanks for letting me have Aimee for a few days so she could hob nob! See you in JANUARY!!! Jeremy...as always your posts are awesome! 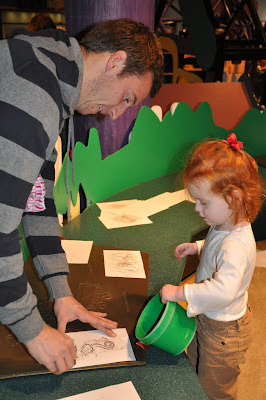 Love that you are taking a "daddy day" once a month! They will love it (and so will Aimee)! :) You two are great parents...those girls are amazing little ones for sure! Great post Jeremy! Congrats on surviving the week. Sounds like everyone had fun and escaped unharmed. I love the idea of a Daddy Day! And I know the girls (and Aimee) will too. Aimee, hope you were able to relax and catch up on sleep a bit during your hob-nobbing trip!